Welcome to our Battlerite Tier List, this is based on the 3v3 mode. This is a list of the Best Battlerite Champions for the current patch. First, we will start with the weakest which are found within F-TIER, while the Best Battlerite Champions are placed in S-TIER. We have included a quick guide on how this Battlerite Tier List Works. Strongest to the Weakest of Champion Choices. These are most undervalued and undesirable Battlerite Champions. Skilled players have no problem playing any character, even picks found within this Low Tier. Players looking for the strongest champions will have better results using a champion found in S or A Tier of this Battlerite Tier List. These are average champion choices, bordering somewhere between weak and strong. There is nothing wrong with playing a pick from this tier, however, there are better choices available for players. A Tier is full of Strong Battlerite Champions. players will likely be playing these or picks from a higher Tier such as S Tier. Welcome to S Tier also known as GOD TIER. These is a special place, where only the Best Battlerite Champions and the Overpowered are found. Most of these Battlerite Champions are in need of some balancing or straight up nerf. 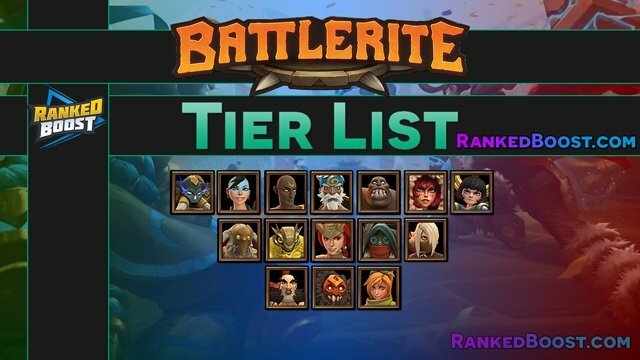 Thank you for viewing our Battlerite Tier List, if you have any questions or concerns about the Best Battlerite Champions you can leave a message below.